Falkreath Stormcloak Camp is a Stormcloak camp located in the mountains of Falkreath Hold, east of Helgen. The Stormcloak soldiers are camped here under the command of Thorygg Sun-Killer. During the related quest Galmar Stone-Fist will take charge here, issuing you with your orders. †This person only resides here during the related quest. The camp itself cannot be seen from the road, but you can see the picketed horses from it. 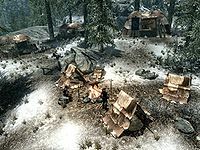 The camp is situated north of the road from Helgen to Ivarstead in the foothills of the Throat of the World. There are six Stormcloak soldiers stationed at the camp, not including the commander or quartermaster. A campfire has a charred skeever cooking over it and three small tents containing unowned hay piles arrayed around it. These are free to use as long as you haven't completed Joining the Legion. Northeast of the fire is the command tent, where the commander spends most of their time studying a tactical map of Skyrim that is laid out over a wooden table and shows the progress, if any, of the civil war. There is also an end table inside the tent. To the southeast are two picketed horses. South of the campfire is a wood chopping block, while to the north is the hospital tent containing four more hay piles, three of which are occupied by sick and injured Stormcloaks. Outside the tent, to the right is a low table with a random potion of healing and a random potion of health on top. Beside this is another table with an alchemy lab built-in. Northeast of the hospital tent is a large tent set up as the commander's sleeping quarters. It contains an owned bed roll, an end table and an unlocked wooden chest containing minor loot. Between the hospital tent and campfire is where the quartermaster has set up an anvil, grindstone and workbench in order to work on weapons and armor. There is a wooden table with a selection of steel weapons and armor. To the left of the workbench are a couple of barrels. The quartermaster will trade spare weapons and armor with you. Two soldiers patrol around the camp, mainly a blind spot to the east that can not be viewed from the camp itself. The camp is initially disabled, but gets enabled after being sent to Whiterun during Before the Storm or you complete either Joining the Stormcloaks or Joining the Legion. A silver ore vein is located 340 feet east-northeast of the camp, up the hill just past the cave. 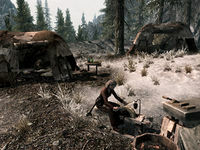 Sometimes after the camp is disbanded after the Stormcloaks take Falkreath, the quartermaster may still be found walking about, though the grindstone, workbench, anvil and table with equipment will be gone. You can still buy and sell items with them. ? This page was last modified on 22 November 2018, at 07:48.